May the 1st marks the beginning of a nation-wide campaign by the National Fishworker’s Forum (NFF). A campaign to draw public attention to what must be the biggest scam the country has ever known – the sale of India’s 7500 km-long coastline and marine waters to private buyers. And this great coastal sale today brings with it homelessness, insecurity and joblessness at unprecedented levels for India’s traditional fishing communities. The NFF campaign is being launched in Gujarat for it is here, the state with the longest coastline and largest continental shelf, that traditional fishing communities are already facing the brunt of unplanned growth and unbridled commercialization. 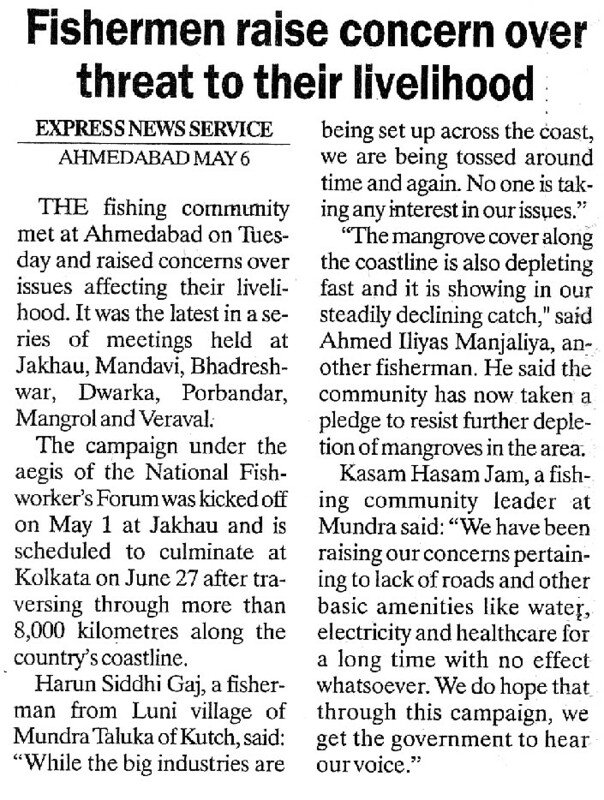 The two-month long campaign, scheduled to end on the 27th of June 2008 in Kolkata will commence at Jakhau in the Rann of Kutch with ceremonial plantation of mangrove by the fishing community. This will be replicated everywhere along the route of the campaign with the fisherpeople vowing to “protect the coast – protect the water”. The port town of Jakhau symbolises the model of development that has put the lives of traditional fisher folk in utmost jeopardy. The influx of foreign fishing vessels through Letters of Permit and subsidies to destructive trawling gear are wiping out fish resources at an alarming rate. Further, there is massive industrial development that threatens traditional coastal communities - artisanal fishers, small farmers and maldharis - with large-scale displacement. Not just in Jakhau but throughout the Gulf of Kutch, unplanned industrialization poses a grave threat to the fragile coastal environment and to the people whose livelihood depends on natural resources. Coral and mangrove ecosystems which nurture fish and other marine life, so important for the livelihood security of fishing communities, are being systematically wiped out. Coral reefs are poisoned by marine pollution or uprooted by shipping activities and cement companies. Thousands of acres of mangroves are being ruthlessly cut to make way for SEZs, airports and harbours. Poisonous effluents from the burst pipelines of chemical factories have reduced many parts of the coast to biologically dead land. Even as fish resources available to traditional fishers are dwindling, thousands of dead fish are washed ashore Gujarat’s coasts – the victims of oil spillages for which no oil company is ever held guilty. The model of development in Gujarat is being hailed today as the model that other states should follow. No wonder for it has created a new class of capitalists. Four of India’s billionaires, having invested in Gujarat, particularly in the Gulf of Kutch, today find themselves in the list of the world’s richest men. India, we are told, is shining and the future of Gujarat is golden. But it is equally clear that the price for India Shining, Golden Gujarat and the untold wealth of the Ambanis, Adanis, Tatas and Ruias is being paid by the poorest in Gujarat, for example, the artisanal fishing population that is being forced to abandon fishing and take up jobs as labourers in the construction industry, salt works, factories and trawlers. Without minimum wages; without social security; without any protection. And it is the women in these communities who bear the brunt of such unjust development. Fisher women in Gujarat have always faced multiple problems: no land rights; the constant denial of vending rights; poor access to secure and hygienic market spaces; little access to education and health. Their problems are today compounded by growing livelihood insecurity – greater domestic burden as well as the pressure to take up daily wage work so that the family does not starve. As industrialization opens up opportunities for waged employment in Gujarat’s coastal belt, there is a growing influx of migrant labour into the state. Underpaid and overworked women workers form the bulk of the docile and vulnerable migrant workforce in Gujarat’s fish processing plants. In this context, even as the State, through unchecked privatization, abdicates its responsibility to take care of its people, the possibility of social division and unrest assumes frightening proportions. With one fourth of India’s total investments going to Gujarat, the state is today the country’s top investment hotspot. The state government is doing everything possible to make Gujarat the most efficient state for capitalist development. Private investors now profit enormously from investments in essential services: roads, drinking water and electricity. Business houses enjoy attractive tax breaks. Workers can be hired and fired at will. Land acquisition for industrial purposes has never been easier. There are now moves to replace the 1991 Coastal Regulation Zone (CRZ) Notification, the only piece of legislation that attempted to check unbridled coastal commercialization, with a new law for coastal zone management. Violations of the 1991 CRZ notification in Gujarat are numerous. They include sand and mineral mining; mangrove felling; destruction of corals; polluting factories in protected coastal zones; toxic dumping in protected marine areas. For long, coastal communities in Gujarat have been up in arms against such violations. One response of the state was to declare a part of the Gulf of Kutch as MarineNational Park and Sanctuary. As a result, maldharis and fisher people can now no longer enter many of the same ‘protected areas’ in which Reliance, Essar and other oil companies have been allowed to lay oil pipelines. The proposed Coastal Zone Management Notification is just another name for more such ‘management’ in favour of industrial interests. Gujarat is the laboratory where thanks to a massive World Bank loan the coastal zone management framework is already being tested. Deregulation however will mean the death knell of traditional fisheries and the marine ecology of Gujarat. The numerous CRZ violations that people’s struggles in Gujarat have fought against will be let off the hook and its coasts will be opened up to further plunder. Time is running out. Alarm bells have already rung. 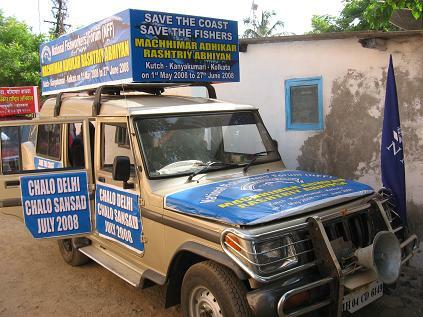 Let us all join hands and say in one voice: SAVE THE COAST- SAVE THE FISHERS. 1. Recognize Inalienable Traditional and Customary Rights of Fisherpeople over Coastal Lands and Waters. 4. Enact National Legislation for Conservation of Coastal and Marine Biodiversity that inter alia protects Traditional Fisherpeoples’ Preferential Access and Historic Use Rights to Coastal and Marine Resources. 7. Develop Regional Mechanism to Facilitate Reciprocal Access to Adjacent Maritime Waters of Neighbouring Countries. Fishworkers Should Not Be Made Victims of Maritime Boundary Disputes. 8. Recognize and Uphold the Importance of Women’s Roles in Fisheries – Recognize Their Rights to Social Security, Land for Fish Processing and Marketing, Basic Amenities, Child Care, Credit and Transport Facilities. 9. Waive All Debts of Poor Fisherpeople along with the farmers. 10. Provide Sufficient Cheaper Fuel for Sustainable Fishing. 15. Enact National and State Legislation to Extend the Benefits of the ILO Convention on Work in Fishing to all Fishworkers. 20/4 Sil Lane Kolkata – 700015. Tel: 91-33-23283989. Mobile: 91-9434039599; 91-9869115294. Today, there have been 11 visitors (26 hits) on this page!